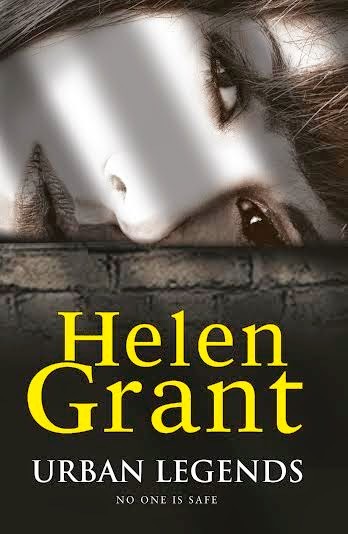 Urban Legends by Helen Grant is the third and final book in the Forbidden Spaces trilogy that began with Silent Saturday and Demons of Ghent. This series has been about a teenage girl, Veerle, and about her on/off relationship with Kris, and about the complicated dynamics of her family. It's been about urban exploration and about Veerle and Kris's run-ins with serial killers. It's all very tense and thrilling but also emotional. I was so very excited to read the conclusion to this trilogy and my heart was in my mouth at several points as I was really, truly worried about the outcomes of these two amazing characters. Helen Grant gave us a very tense story with Urban Legends but also one filled with heart-breaking scenes and plenty of surprises! The rest of the review may (and probably does!) contain spoilers for the first two books in the trilogy. Proceed with caution. Urban Legends follows shortly on from the end of Demons of Ghent with Veerle moving back to the small village where she lived with her mother. She's re-enrolled in school and is hoping to keep her head down, study, and get her diploma after failing the previous year. She's still sort of seeing Bram, even though he's still living in Ghent, and Veerle has promised her dad that she wouldn't see Kris. As with the previous two books, Veerle's narration is interspersed with short, slightly disturbing chapters from the perspective of the serial killer which gives the reader an indication of what might be happening next. In Urban Legends, there is also a third perspective from a group of urban explorers who gather in abandoned buildings and locations in order to tell each other urban legends and scary stories but this group of storytellers is being picked off one by one. And soon, all three of these of these threads begin to overlap. I really loved this story. I'm so emotionally invested in Veerle's life and in her relationship with Kris that I was actually desperate to read this story and to find out once and for all. I felt like in the previous two books in this trilogy there was at least one parent figure around most times. But in Urban Legends, Veerle is now 18 and technically an adult. She's living alone and relies only on herself to keep safe and protected. And that made it scarier for me. The tag line on this book is 'No one is safe' and I felt very aware of that fact whilst I was reading. It really does feel like nobody is safe. And I worried. Something happened quite early on in this book that made me do this weird, wailing 'Nooooooo! That didn't happen, right? Surely not.' and had me furiously reading ahead to make sure that that really did not just happen. But all the stakes are raised in this book. The body count is much higher and we have a killer on our hands who will stop at nothing to take out the two people getting in his way: Veerle and Kris. And then there's Veerle and Kris. They've been through so much together and yet they aren't together. It's hard for them both and the reader can see how really difficult it is for them to navigate around the obstacles standing in their way: a current boyfriend, the ghost of an ex-girlfriend. My heart ached throughout for these two. Urban Legends was an exciting end to the trilogy. There was heart-stopping action, surprises that shocked me, this intense relationship, plenty of creepy abandoned buildings and plenty of atmosphere. Fantastic ending, one that I really recommend. If you haven't discovered the Forbidden Spaces trilogy, what are you waiting for? !